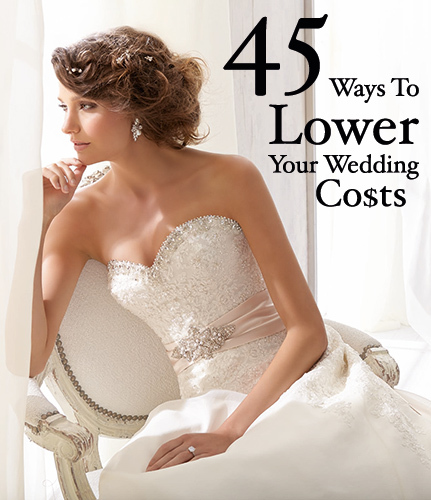 Check out these wedding tips to learn how to save money and stick to a tight budget. A simple update to your plans could save you $10, $100, $1000 or more instantly! Pick and choose from these ideas that will help you keep the wedding of your dreams without draining your bank account. Keep your priorities - What is most important to you? Splurge on those things and cut out or compromise on others. Visit public places - Check out beautiful places like parks and museums that often offer affordable prices. Forget the limo - Borrow or use a personal car instead of renting a limousine. Shop the sales - Shop at sample and trunk sales for dresses or look for package deals or holiday sales. Use your credit - Pay for your wedding with a credit card to earn frequent-flyer miles (for your honeymoon) or cash back. Just be sure to keep up with the payments. Take a cruise - Cruise lines offer discounts or free flights during slow travel times. Limit the video - Ask the videographer to only record the ceremony through the first dance instead of the entire wedding day. Unexpected officiants - If traditional officiants in your area are costly, consider having a friend or relative “ordained” so they can officiate. Just keep an eye on your state’s laws to be sure it will be recognized. Find an affordable city - Consider having the wedding in your hometown or a nearby city that is more cost effective. Get all-inclusive - Choosing a venue that gives you extras like a wedding coordinator, ceremony on site, etc. could add up to big savings. Focus on the couple - Keep ceremony flowers simple by only having floral arrangements on either side of you, instead of scattered throughout the space. Sans bouquet maids - Make a fashion statement by using pin on flowers for your bridesmaids instead of costly bouquets. Sign up - Get on bridal designers' and retail stores' websites so you don’t miss out on a sale or the latest updates. Keep makeup hours short - Hire the best makeup artist you can afford, then ask them to leave behind a touch up kit, and not to stick around for pre-photo retouching. Beautiful bud vases - Instead of elaborate floral centerpieces, try using small vases with simple, sparse arrangements and scatter them on the tables. Try a assistant - Ask your favorite photographer if you can higher their assistant or 2nd shooter for a lower price. They should have the same style, and great training, without the premium price. Find a Champagne alternative - Choose Cava from Spain or Prosecco from Italy, both are sparkling white wines that are a better fit for a small budget. Combine gifts - Instead of a traditional registry, ask guests to contribute to your honeymoon through some great online resources. A designer touch - If a designer cake is a must have, make it just for two. Display it, cut it, but then serve a sheet cake to your guests. Arranging the music - A DJ can be cheaper than a band, but to make a band more manageable ask if just few members can play at the ceremony before they join the full band at the reception. Get help - Ask your artistic friends or relatives to help with stationary, baking, decor and more. Even assistance setting up before the wedding could be a great help. Something borrowed - Consider borrowing bridal accessories from family and friends instead of buying. Remember to negotiate - It never hurts to ask for a lower price before signing a contract with a vendor. Keep guest lists in check - To help minimize the list, refrain from inviting children, co workers, or friends' causal dates. Best of friends - Keep your bridal party as small as possible to save on dresses, gifts, and flowers. Go off-season - Vendors may reduce fees if you choose winter over summer. But, you will want to avoid holidays and may consider a Friday or Sunday over a Saturday. Get crafty - Make your own favors for a personal touch that is often less expensive. Use what you have - Supply your own jars or containers for floral arrangements. Combined efforts - Use wedding favors as seeting or place cards to save on supplies and time. Guests can pick up labeled favors at the door and take them to their assigned seat or have named favors waiting at their seats. Flowering bulbs - Flowers such as hyacinth and amaryllis often cost less than other flowers and add a touch of drama to simple centerpieces. Low cost flowers - Get more for your money with common flowers like daisies and carnations. They are available year round and make beautiful, full, yet affordable bouquets or centerpieces. Favors at the center - Instead of traditional floral center pieces, upgrade the favors and make them the focal center. Light up the tables - Single candles or an arrangement of small votives can make beautiful centerpieces. Brighten with fruit - Consider colorful fruit centerpieces arranged in bowls or on cake stands. Double-duty - Re-purpose your ceremony flowers as table centerpieces at the reception. They could also decorate the guest-book or seating-card tables. Affordable embellishments - Mix in berries, pinecones, or other economical non-floral foliage to fill out bouquets and displays. Limit the bubbles - Only pour champagne in a single glass for each guest to toast the bride and groom, rather than serving all night. Top it off - Order a simple, modestly-priced cake and adorn it with a stand-out topper to make it memorable. Punch and cake - Keep it simple and affordable with a late morning or afternoon cake and punch reception. Make it special with different flavors of cake and colorful punch. Say no to full service - How dinner is served can make or break the budget. The most economical way is to serve family style where guests help themselves at the table. Affordable main courses - Only use expensive ingredients, such as lobster, in hors d'oeuvres rather than for the main. Keep it local - Ask that the caterer use local produce for a fresh and economical option. Early meals - Consider a wedding breakfast or brunch which usually has more affordable food, are shorter, and the guests tend to consume less liquor. Limit alcohol - Keep the selection to beer and wine to satisfy most guests. Shop around for bulk sales to save even more. Signature drinks - Serving a custom cocktail instead of providing a full bar can keep liquor bills in check and add a personal touch.